ESPN said Tuesday that it's pulling on-air segments sponsored by one of the companies implicated in a possible scandal that's rocked the billion dollar world of fantasy sports. During an afternoon appearance on "Outside the Lines," ESPN anchor Bob Ley detailed how the company is adjusting its partnership with DraftKings. 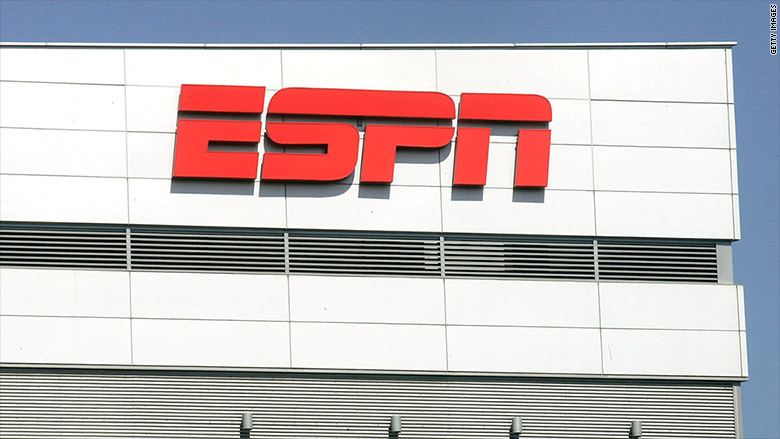 "ESPN today continued running commercials for the two main daily sports fantasy companies, but has removed sponsored elements from within shows," Ley said. A spokesperson for ESPN confirmed to CNNMoney that the channel has pulled DraftKings billboards and sponsorship out of news programming on Tuesday, adding that it is "standard procedure for us to pull these kind of sponsorships and integrations when we are covering significant news, to avoid any suggestion of influence on our coverage." The spokesperson said that ESPN is evaluating the integration of DraftKings in its programming on a day-to-day basis. And contrary to Ley's on-air statement that the commercials are still running on ESPN, the spokesperson said that DraftKings pulled its ads on the channel on Tuesday. The decision comes a day after the New York Times reported that a DraftKings employee admitted to inadvertently releasing data prior to the slate of Week 3 NFL games, prompting claims that the employee may have used insider information to win a $350,000 prize at FanDuel. That admission forced DraftKings and FanDuel, two of the biggest companies in fantasy sports, to defend their business practices. The two companies said that they have banned employees from playing fantasy games for money. There's been no avoiding DraftKings ads on ESPN. The two sides completed a deal over the summer making DraftKings the official daily fantasy company of ESPN. As a result of that deal, DraftKings was integrated across ESPN's programming. Matthew Berry, ESPN's senior fantasy analyst, even serves as a paid spokesman for DraftKings. Last month, well before the insider trading scandal erupted, Berry was forced to defend this arrangement after he was inundated with criticism from readers. Berry said that his integration of DraftKings changed little about what he had written and, above all else, he is a fan of the company he's paid to promote. "I really enjoy playing daily fantasy and I really enjoy doing it on DraftKings," Berry wrote. "I'd recommend them anyway, so if they want to send me a check to do it? You bet. Where do I sign?"